” Better health care creates no losers : Australia is beset by a rising wave of complex chronic health conditions that will lead to many years of life spent in ill health, lower involvement in work and rising costs for the health care system. Suppliers rather than patients are the centre of the current system — an anachronism built on paternalism. Prevention and management of these conditions by integrating care provided by GPs and other clinicians with care in hospitals is one antidote. Change can be orchestrated locally if the Australian, State and territory Governments move away from centralised control. It is time to move to full adoption of patient-centred care, where the outcomes for, and experiences of, people are the key focus, but getting buy-in from clinicians is a critical part of this. A DRAMATIC overhaul of Australia’s health system could boost the economy by $200 billion over two decades, a Productivity Commission ­report has found. 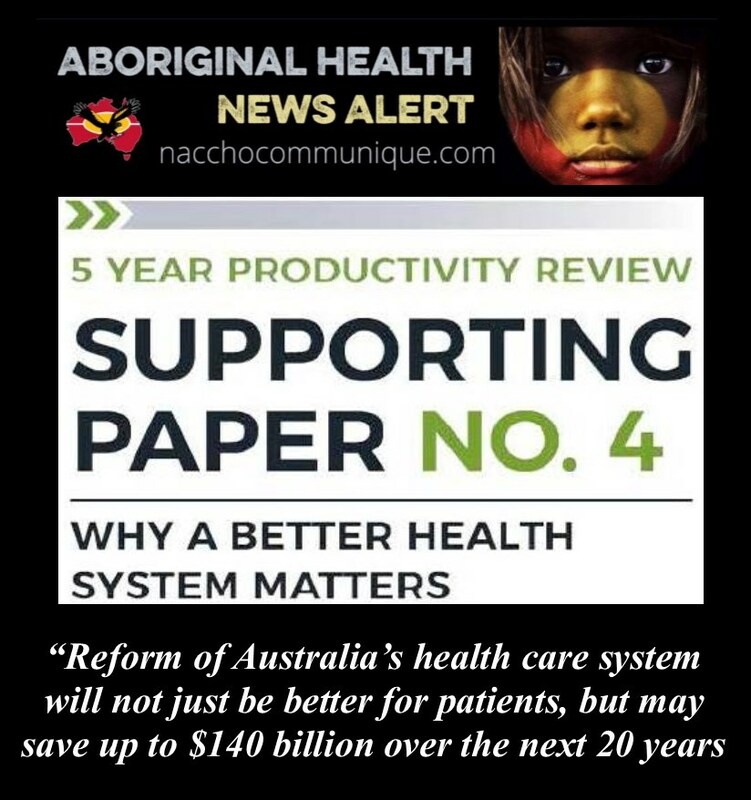 The review blames a lack of communication between healthcare specialists for contributing to many of the issues faced by every Australian, and calls for a “reboot” of the way the system is integrated. The 1200-page “Shifting the Dial” report, released 24 October , has found that despite the average Australian living to 82.8 years — the third highest among developed countries — Australians are spending the longest amount of time in ill health. The wide ranging review also warns that fundamental flaws in the university system have led to one in every five graduates being unable to get a full-time job. Productivity Commission chairman Peter Harris criticised “non-existent communication between different parts of the health system” and recommended the federal government consider strategic overhauls to the way the sector operates. The review warns that 17.5 per cent of Australians have mental or behavioural problems and a suicide rate double the economically best-performing countries. It found less than 20 per cent of GPs know when their patients have been into an emergency ward, compared with 68 per cent in the Netherlands and 56 per cent in New Zealand. Treasurer Scott Morrison said the findings should force governments and the sector to consider the effectiveness of the health system. “Improving the health of Australians is not just about enhancing our quality of life, it’s an economic growth strategy,” Mr Morrison will say when launching the findings today. 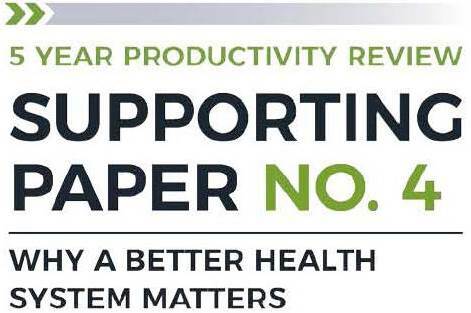 ‘Individual health leads to national wealth, and it’s great to see that the Productivity Commission has recognised this in its Shifting the dial: 5 year productivity review report released today’, says Alison Verhoeven, Chief Executive of the Australian Healthcare and Hospitals Association (AHHA). ‘It’s also gratifying that the report recommends shifting the focus of our health system from providers to patients. ‘AHHA has been advocating for some years now for better patient-centred and integrated care, with attached funding and care pathways, and information flows. ‘We have also been advocating for health funding mechanisms based on value and outcomes, rather than on service volumes—which the Commission is also recommending. ‘We also support the Commission’s call for better integration of primary care and hospital care at a local level, with a view to boosting preventative measures and minimising unnecessary hospital admissions. ‘We think it is incumbent on the Commonwealth to use the recommendations in this report as a starting point for negotiating its post-2020 public hospital funding agreement with the states and territories. In the future, we cannot rely on high commodity prices or, given an ageing Australia, labour participation rates, to drive national income. We might try to invest more to add to growth, but capital must be paid for, and investment to GDP rates are already at historically high levels, so there may not be much room to move. That means that innovation and learning — doing things better — is the key for prosperity. Yet this has languished in Australia (and many other countries) for a decade. Getting better outcomes involves new agendas involving the non market economy (mainly education and healthcare), the innovation system, using data, creating well-functioning cities, and re-building confidence in institutions. And no one wants clogged cities or arteries. Australia is beset by a rising wave of complex chronic health conditions that will lead to many years of life spent in ill health, lower involvement in work and rising costs for the health care system. Suppliers rather than patients are the centre of the current system — an anachronism built on paternalism. Reform of Australia’s health care system will not just be better for patients, but may save up to $140 billion over the next 20 years. Slipping school results and concerns about teaching quality raise questions about how Australians will adapt to the wave of changes in the economy over the coming decades. The vocational education and training system is in disarray. It will not be too long before universities will be the key vehicle for skill formation, yet their teaching function plays a subordinate role to their research role, and the outcomes for many graduates are poor. Better teaching quality, re-building the VET sector, genuine options for acquiring new skills as people switch jobs and careers, using new technological models for educating people, and creating teaching-only universities are just a few of the many changes that need to be made. Australian cities are under pressure — rising population and congestion, poor infrastructure decisions, ad hoc and anticompetitive planning and zoning, and an unsustainable funding basis for roads. Stamp duties are bad taxes, a bonanza in times of rising housing prices, but unfair and inefficient. Road funds that respond to where people want roads is one step to change, as is a switch to taxes on unimproved land value. There are good models of zoning and planning that could readily be adopted, and infrastructure decisions could be enhanced by taking out the ‘Utopia’ factor in their preparation. While Australians’ trust in governments and their institutions is low and fragile, there are practical things that can be done to make governments work better. A key will be that the Council of Australian Governments chooses to restore its role as a vehicle for economic and social reform. The scope for the vital big reforms will require commitment to a joint reform agenda by all jurisdictions. This should be negotiated in 2018, collecting all ideas into a cohesive whole. Of course, market-based reforms are evident and available — to address the persistent failure of Australia’s energy market, redundant regulations, and flaws in workplace relations — but we know this already. The Australian, State and Territory Governments should allocate (modest) funding pools to Primary Health Networks and Local Hospital Networks for improving population health, managing chronic conditions and reducing hospitalisation at the regional level. Set aside a small share (say 2 to 3 per cent) of activity-based funding to hospitals to create a Prevention and Chronic Condition Management Fund (PCCMF) for each Local Hospital Network (LHN) to commission activities that improve population health and service quality, or reduce hospitalisations and broader health expenditures. Where they are directly related to prevention and management of chronic conditions, allocate the expected funding from the Practice Incentives Program and other Medical Benefit Schedule items to Primary Health Networks (PHNs) in each region. Give LHNs autonomy about how they spend from their PCCMF (including a license to fund innovations) and give them certainty over future funding contributions to allow planning. Assess the returns from PCCMF investments. Let LHNs retain some of the returns from PCCMFs, with the remainder shared among Australian, State and Territory Governments. Disseminate the lessons from effective interventions funded through PCCMFs to other regions. Ensure formal collaboration between LHNs and PHNs to improve population health and the effectiveness and efficiency of primary health care. Where relevant, involve other regional groups with capabilities in managing population health, including Local Governments and community organisations. The Australian Government should allow LHNs to commission the services of GPs by amending section 19 of the Health Insurance Act 1973, with the proviso that the LHNs operate in formal agreement with their region’s PHN. The Australian Government should also remove any administrative constraints on PHNs allying with LHNs to commission GP services. Amend the Australian Government’s prospective Health Care Home model so that LHNs and PHNs can introduce local variants, with supplementary funding and design features determined by them through collaboration. Clinician buy-in is essential to achieving change and will be led by PHNs, which have often built good relationships with local leaders. Further details are in Conclusions 6.1, 6.2 and 6.3 of Supporting Paper 5. 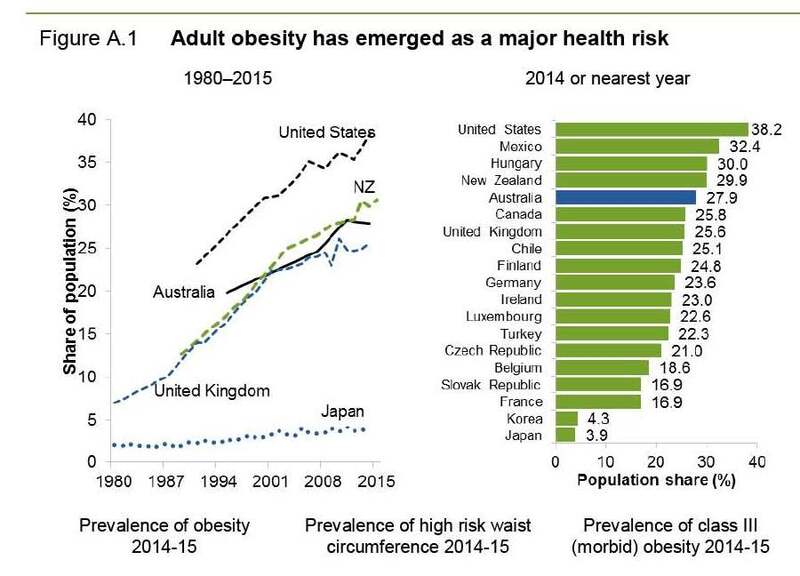 Australian governments should revise their policies to more rapidly reduce the use of low-value health interventions. More quickly respond to international assessments indicating low-value medical interventions. Create more comprehensive guidelines and advisory ‘do not do’ lists. Disseminate best practice to health professionals, principally through the various medical colleges, the Australian Commission on Safety and Quality in Health Care and similar state-based bodies. Collect and divulge data at the hospital and clinician level for episodes of care that lead to hospital-acquired complications and for interventions that have ambiguous clinical impacts (such as knee arthroscopies). Provide accessible advice to patients about potentially low-value services and improve their health literacy using the measures covered by Recommendation 2.3. Ensure that ongoing processes for reviewing existing Medical Benefit Schedule items are more rapid and comprehensive than occurred under the arrangements prior to the Robinson Review. Give priority to de-funding interventions that demonstrably fail cost effectiveness tests, moving from volume to value. Remove the tax rebate for private health insurance ancillaries. More details are in Conclusion 7.1 of Supporting Paper 5. All Australian governments should re-configure the health care system around the principles of patient-centred care, with this implemented within a five year timeframe. Develop well-defined measures of people’s experience of care and the outcomes they observe (so-called Patient Reported Experience and Outcome Measures — PREMs and PROMs), and integrate these into disease registries. The Australian Commission on Safety and Quality in Health Care should be the orchestrator of these developments. Publish results so clinicians, hospitals and patients see how the system is working at a grass roots level. Consult with consumer groups representing patients and with the various medical colleges to achieve acceptance of the new model and its implications for practices. Improve patient health literacy to a level that far more people would have a capacity to self-manage chronic conditions, make informed end of life decisions, and be able to solicit from, and interpret information given by, clinicians (Supporting Paper 5). Use My Health Record and other IT platforms to involve people in their health decisions. Give people a greater capacity for making choices between alternative suppliers, underpinned by transparent measures of prices and performance. Give greater weight to patient convenience, and develop and disseminate technologies that assist this. Systematically include an understanding of patient-centric care in the education and training of new health professionals, and use the various professional bodies to disseminate an understanding of the issues to existing health professionals. Use data analysis to identify very high service users across all major service types and discover the reasons for their high use (Recommendation 2.4). Use this to customise care plans and other targeted early interventions to improve their health status and reduce their use of services. Australian governments should cooperate to remove the current messy, partial and duplicated presentation of information and data, and provide easy access to health care data for providers, researchers and consumers. registers of health care data are created and published on data.gov.au, in line with recommendation 6.4 of the Productivity Commission’s inquiry into Data Availability and Use (PCDAU). Implement recommendation 6.6 of the PCDAU regarding the establishment of the Office of the National Data Custodian, which will have responsibility for the implementation of data management policy for health care and other data. Streamline approval processes for access to data, in line with recommendation 6.7 of the PCDAU. use data analytics to discover bottlenecks in integrated care systems, prospectively identify high-risk groups, identify the long-run effectiveness of preventative measures, and better isolate low-value interventions. Governments should cooperate to reduce the existing inconsistencies in the multiple population health surveys and hospital and other satisfaction/experience surveys, accompanied by the development of benchmarks for gauging the relative performance of health care providers and purchasers across all national regions. Any webpages or other sources that provide information to consumers about health care services should be comprehensive and maintained, and if that is not cost-effective, they should cease to be funded by governments. Ensure uptake of electronic medical records by health professionals and hospitals by making them easy to use, and in some cases, linking access to additional funding to their adoption of integrated information systems. Use My Health Record for both information and as a platform for providing clinically proven advice to patients, with the potential development of links between it and wearable technologies. The Australian Commission on Safety and Quality in Health Care, in collaboration with other State and Territory Government agencies, should be a clearinghouse for the results of evaluations of regional innovations, and report on the diffusion of substantiated best practices across regions. Create a cooperative ‘Champions Program’ that uses people with hands-on-experience with innovations to assist others to copy them. The Australian Government should move away from community pharmacy as the vehicle for dispensing medicines to a model that anticipates automatic dispensing in a majority of locations, supervised by a suitably qualified person. In clinical settings, pharmacists should play a new remunerated collaborative role with other primary health professionals where there is evidence of the cost-effectiveness of this approach. Identify the best dispensing technologies from those that are currently available. Consult with the relevant training institutions — most likely in the vocational education and training sector — to develop courses for such qualifications. Inform the various university departments of pharmacy about the reduced need for future supply of pharmacists. Determine the locations for automated dispensing, taking into account accessibility and security, but eliminating unnecessary boundaries on locations now endemic in pharmacy planning rules. Identify where it is cost effective to use pharmacists in primary health, taking into account the capabilities of lower-cost health professionals, and the increasingly greater capacity for information systems to provide accurate advice about medicines to GPs and other professionals. Phase in the changes after the Sixth Pharmacy Agreement has lapsed, using the time to test it in some natural settings to refine the model. The Australian Government should move towards an alcohol tax system that removes the current concessional treatment of high-alcohol, low-value products, primarily cheap cask and fortified wines. Ideally, this would be achieved through a uniform volumetric tax rate for alcoholic beverages, calibrated to reflect the health impacts of alcohol consumption. Exemptions could be made for the first 1.15 per cent of alcohol (consistent with the current policy for beer). A transition period would be needed to allow the wine industry time to adapt. Phasing out the existing range of concessional alcohol excise rates — including for draught beer and brandy — would also help to simplify the tax system and make it less distortionary. Alternative models that would avoid significant price reductions for expensive products — with the regressive income impacts this would entail — could include a modified WET (wine equalisation tax) system with a minimum volumetric tax or the introduction of floor price regulation. However, further work on these options is needed to determine their feasibility in light of likely administrative burdens and implementation issues. Tax measures should be accompanied by other policies that increase education about alcohol and assist people with alcohol-related conditions.